Up here at the Borderlands Lodge, it's been a pretty busy year--one reason why I wasn't able to post very regularly. Mainly, my time has been spent working on a book. It's been crazy. As I've mentioned elsewhere, writing a book has been the most humbling and humiliating process I've ever been through. Part of the problem was, once I'd finished my dissertation, there were basically three directions that I thought I could take the book. As of February of last year, I'd cycled through two of those options, and had received nothing but rejections from the publishers I'd contacted. I really felt like I was down to my last strike, so (to continue with the sports analogies) I swung for the seats. I ended up writing on a topic that I'd earlier dismissed, one that I thought was too hackneyed or silly to write about. Wouldn't you know it? Of course, that was the very idea that people ended up finding interesting. It might sound strange to hear that I had three basic ideas for the book, but 85% of each of these projects was based upon the same material. The difference occurred mainly in the big-picture elements. Starting with a meeting with a few of my colleagues in February of last year, I worked at a furious pace last year. This was especially the case over the summer. 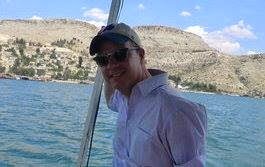 I was in Bozeman for most of the time, but also spent a couple of months in Turkey and Georgia. Even during these travels, however, I was writing like crazy. Then, back at school in the fall, I would set my alarm in the morning to write for hours before classes started, then whiled away many an evening at the Lodge writing until I would literally start falling asleep while I sat in my chair facing the computer. So it felt pretty good to see the book advertised the other day on the website of Oxford University Press. 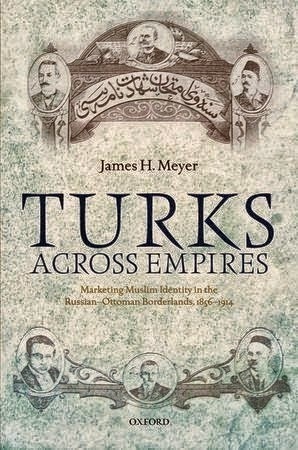 The book's called Turks Across Empires: Marketing Muslim Identity in the Russian-Ottoman Borderlands. It's scheduled now for publication in October, though that's still a tentative date. The book is about the pan-Turkists, a group of Russian-born Muslim activists who are generally known today for having been early Turkish nationalists. In particular, I look at three people who were most closely associated with pan-Turkism: Yusuf Akçura, İsmail Gasprinskii and Ahmet Ağaoğlu. Rather thank look at these people as intellectuals, however, I trace their lives and adventures in both Russia and Istanbul. I focus on their roles as activists, and stress the important ways in which their experiences paralleled those of a much broader population of Muslims living between the Russian and Ottoman empires in the late imperial era. In particular, the book argues that there were three main ways in which the pan-Turkists were embedded within their communities. Looking at the themes of mobility, revolution and the politicization of identity, I discuss how these three features of the late imperial era have also become important characteristics of international geopolitics in the post-Cold War era. The people I write about all did interesting things. 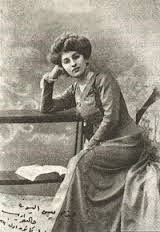 They led international lives between Russia, the Ottoman Empire, Paris and points in between. They were also involved in the wave of revolutions taking place in the region at this time in Russia (1905), Iran (1906) and the Ottoman Empire (1908). Often portrayed as the architects of the Turkish nation-state created in the aftermath of WWI, the pan-Turkists often found themselves on the outside looking in once the age of empires had passed. The pan-Turkists and their friends--people like Fatih Kerimi, Ziya Gökalp and Halide Edip--were not so much the forefathers and foremothers of Turkish nationalism as they were the final expressions of the late imperial era. In the end, my goal was to write a book that would serve three purposes: a) tell a good story about three fascinating individuals; b) discuss what I consider to be three of the most important features of the late imperial era; and c) write about politics and identity today, emphasizing the lessons that we can learn from the experiences of my book's subjects. There's still a lot of work to go. Presently, I'm waiting for the copyedited manuscript, which I will then have to go over and make final changes to. There are also some other matters that still need to be worked on, such as the index, that need to be attended to. All in all, it will still be a busy summer. It feels weird writing about the book here and posting a link to OUP's advertisement. For so long, I've been afraid to talk about it in anything but the most conditional of terms. I'm still afraid of jinxing things, frankly, but if Oxford is putting it on their website I figure I might as well allow myself to do so as well. In any case, I'm glad to have put most of this experience behind me. Suddenly, I have an extra 10-12 hours a day that I can use to think about other things, mostly. In addition to working on the remaining tasks related to the book, I've been reading, cooking and riding my bike in the generally spring-like weather, as well as jotting down ideas for new projects I'd like to work on. Who knows? I might even take a vacation.